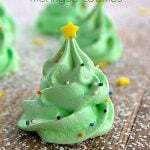 Christmas Tree Cookies, fun and festive meringue cookies that are light as air and melt in your mouth! 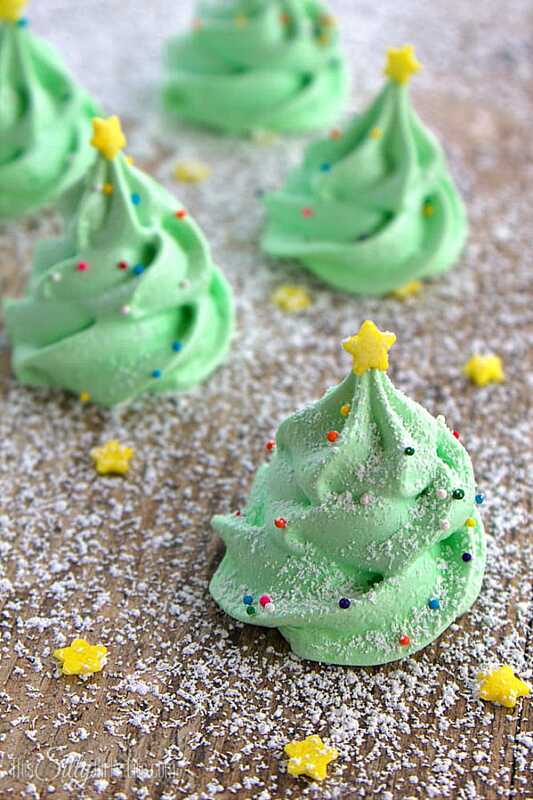 These super cute Christmas Tree Cookies are perfect for your holiday party! Who doesn’t love a fun Christmas Tree Cookie! It’s the last week of the Christmas series and I wanted to end it with a bang! 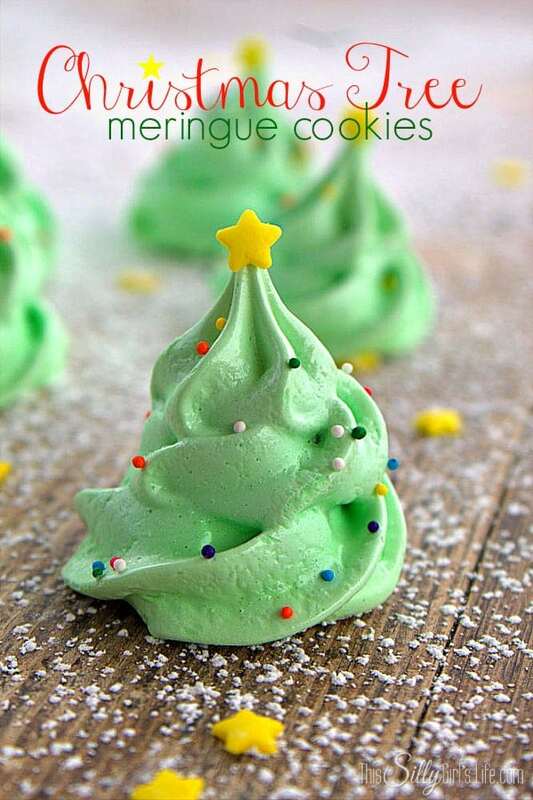 Aren’t these Christmas Tree Meringues Cookies the cutest?! Take me to the recipe for Christmas Tree Cookies already! If you would rather not hear my super helpful tips and tricks, FAQ, and my overall awesomeness and get straight to this delicious Christmas Tree Cookies recipe – you can very easily scroll all the way to the bottom of this post for the full printable FREE recipe! Bon appetit. Dusting these easy meringue cookies with powdered sugar made it look like it snows… it’s so cute Imma die! Seriously though, eeek! LOL, I know, I’m a weirdo but I just can’t help it. 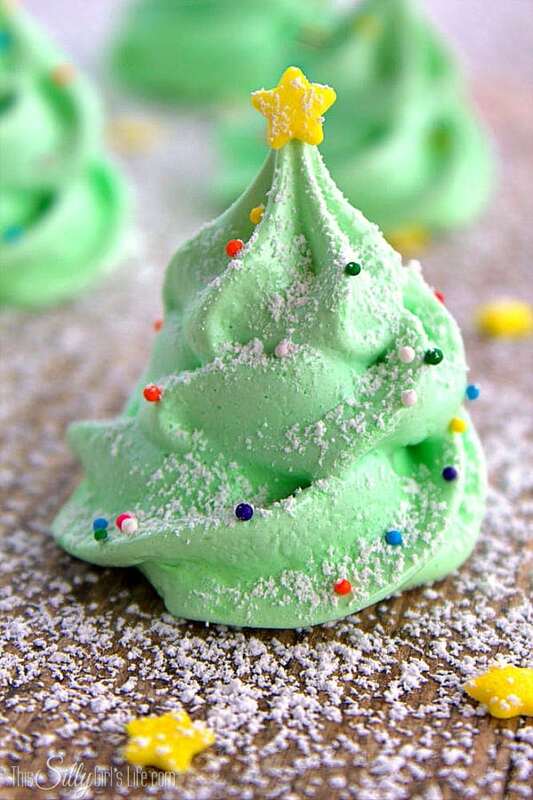 These Christmas Tree Meringues are so flippin easy and delicious! 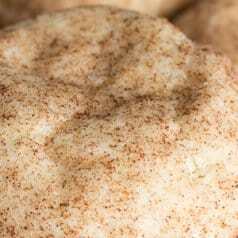 I used almond extract for mine but you can substitute any flavor your love! This recipe is adapted from Cake & Allie. Place egg whites, sugar, and cream of tartar in a bowl of your stand mixer. Place bowl over boiling water on the stove. Whisk vigorously until sugar dissolved and there are no more sugar granules visible. Remove from heat and whisk in the extract. Using the whisk attachment on a stand mixer, mix on medium high until egg whites become bright white but still runny. 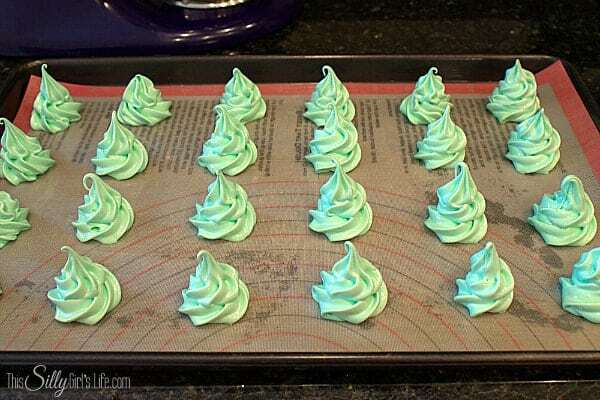 Add in food coloring to the color you want and continue to beat to form stiff peaks. Pipe cookies onto a baking sheet lined with parchment paper or a silicone mat. Bake for 2 hours. After 2 hours, turn off oven, open door slightly and let sit in the oven an additional 2 hours. Place the star sprinkles on top with a tiny dab of frosting. Place mixture into piping bag with large star tip. With a circular motion while squeezing the meringue out of the bag build the trees. You want to pipe in a circle while layering the meringue up and on top of itself. Make cookies about 1 inch in width, 2 inches high and place 1 inch apart on baking sheet. They are done when you can easily lift them off the parchment and the bottoms are dry. They should not be brown. Make sure to cook them at a low temperature for a long time. This was my first time making these easy meringue cookies they came out perfectly! They are sooo easy, you can do it too! Check back next week because December will be jam packed with more treats! If you love this cute Christmas recipe make sure to check out my Reindeer Chow, Christmas Tree Cupcakes, and my Cinnamon Cream Cheese Cookies! All perfect additions for this holiday season! Make these fun and easy Christmas Tree Cookies for your next holiday party! Heat oven to 200 degrees. Place egg whites, sugar, and cream of tartar in a bowl of your stand mixer. Place bowl over boiling water on the stove. Whisk vigorously until sugar dissolved and there are no more sugar granules visible. Remove from heat and whisk in extract. Using the whisk attachment on stand mixer, mix on medium high until egg whites become bright white but still runny. Add in food coloring to the color you want and continue to beat to form stiff peaks. Place mixture into piping bag with large star tip. Pipe cookies onto baking sheet lined with parchment paper or silicone mat. Make cookies about 1 inch in width, 2 inches high and place 1 inch apart on baking sheet. Sprinkle with the multi color sprinkles. Cook for 2 hours. After 2 hours, turn off oven, open door slightly and let sit in oven an additional 2 hours. Place the star sprinkles on top with a tiny dab of frosting. Serve and enjoy! Is the almond extract for flavor only, or does it serve an additional purpose? I’m wondering if another flavor extract would affect the outcome. My daughter is allergic to nuts and I’d like to use a substitute of possible. It’s just for flavoring, you can use any extract in it’s place! These are so adorable! Can I make them a couple of days ahead and how do you store them? Covered or uncovered? Yes you can make them a couple days ahead. You can store them loosely in a container covered but do not put them in the refrigerator. Thanks for asking! These are great I’m going to try them! Why do you have to put the star sprinkle on at the end? 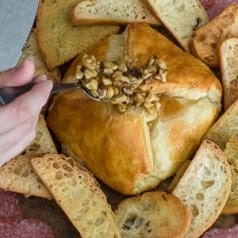 Can you just place them on the tip of the peak before baking? You know, I really don’t know why I did that. It was my first time making meringues so maybe I was nervous about it, LOL. It would probably be fine to bake with it, but I’m not positive. Thanks for asking! Your recipe is great and easy to follow. This is my first time making meringues cookies and they are beautiful. I am adding them to my standup gingerbread houses. They are in the oven now with one hour to go. Thank you!!! YAY! I’m so glad they are working out for you. I would love to see your houses when everything is done! You can tag me on instagram @thissillygirlskitchen if you plan on sharing, thanks again! is the a reason almond extract is used versus vanilla extract? I just made these the night before Christmas eve, and they are so cutie cute!! Mine are a litte different due to piping tip I had, but still worked, an cute. Taste great. Did almond flavor an vanilla paste one’s and they’re both great. Thanks for the inspiration and recipes.